I wish you, my dear readers, all over the world: a very Happy, Joyful & Fun 2018!! 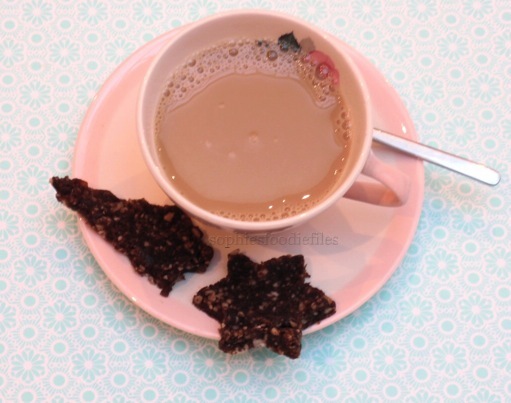 At Christmas Eve, I served these lovely home-made Festive Buckwheat Cookies with coffee after my dessert. My guests all loved them so much. There are some special ingredients in these lovely cookies! Can you guess which one’s? 1 +1/2 teaspoon finely chopped fresh rosemary, no stalks & wooden bits! 1. Take your Kenwood machine & place the K-paddle in. In fitted bowl below, add margarine, coconut sugar, orange zest, chopped rosemary & salt. Mix well on medium-speed. Now, add flax egg & mix in. Add buckwheat flour & chopped nuts. Mix it all in on medium-speed. Stop machine from time to time to scrape the sides of the bowl. Mix it all in. Finally, add the mini chocolate chips & mix in. 2. The dough looks wet & sticky but this is normal. Take some clingfilm & open it ups. Place your dough in it.Close the clingfilm all over your dough & shape it like a long sausage. See that your sausage shape is equally thick everywhere. See that you end up with about 14 slices. Place clingfilm all over the dough & place into the freezer to firm up a bit, for about 2-3 hours. Once, I left in overnight in the freezer but it didn’t make a difference with the normal 3 hours. When you want to bake your cookies, preheat your oven to 170°C for 10 minutes. Then, take the dough out of the freezer & remove clingfilm. On a chopping board, with a very sharp knife, carefully slice about 14 equally thick slices. They will be about 1 cm thick! The dough will stick a bit! Place them, spaced apart, flat onto a silpat on an oven rack. Bake into the lower end of your oven for about 10-12 minutes or until the edges of the cookies turn brown. Watch them carefully so that they do nut burn! After, half of the baking time, so after 6 minutes, turn the oven rack around into the oven, to get an equal bake. This works! 3. When your cookies are golden brown & ready, carefully transfer them onto a cooling rack to cool down completely! 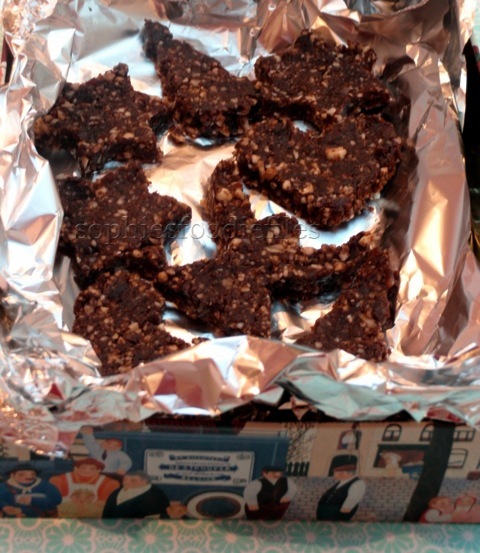 They are perfect with the crunch, the nutty hazelnuts, orange zest, a hint of rosemary & some good chocolate. What else do you want of a cookie? Perfection! 🙂 Keep cookies in a cookie box! They keep for 5 days after baking! Enjoy! 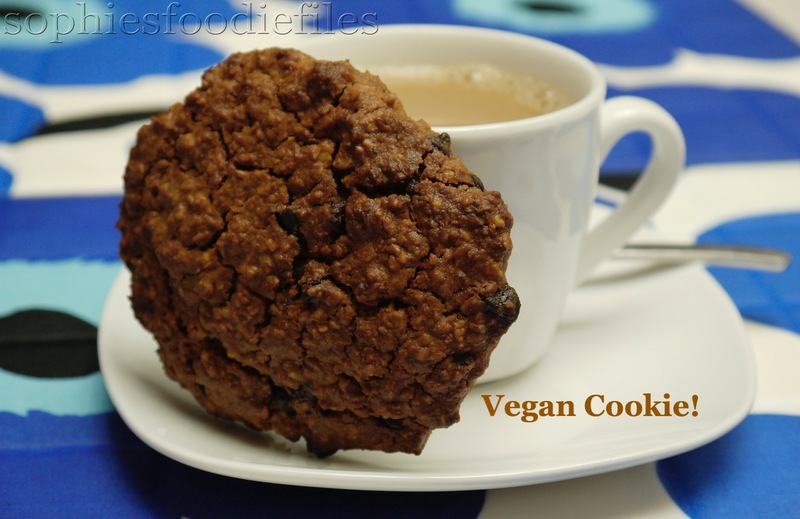 These divine soft cookies are Vegan + Gluten-free! They are a great breakfast, a lovely snack or a great dessert! They are also lovely enjoyed with some good coconut tea on the side: double yum! They also make an excellent food gift, all nicely wrapped up! Don’t you want a big bite? 1. Preheat your oven for 10 minutes on 180°C ( 350 F ) & take 2 baking trays out of the oven. 2. Take the large bowl of your Kenwood or Kitchen aid and place the K-paddle in. Add sifted coconut flour, coconut milk and almond butter. Mix well on medium speed to emulsify everything together. Scrape the bottom and sides of the bowl & mix again. 3. Now, add vanilla extract, GF baking powder, dark chocolate chips, agave and unsweetened coconut flakes. Mix well on medium-speed until all comes together. Scrape the sides and bottom from your bowl & mix again until all is well blend in. 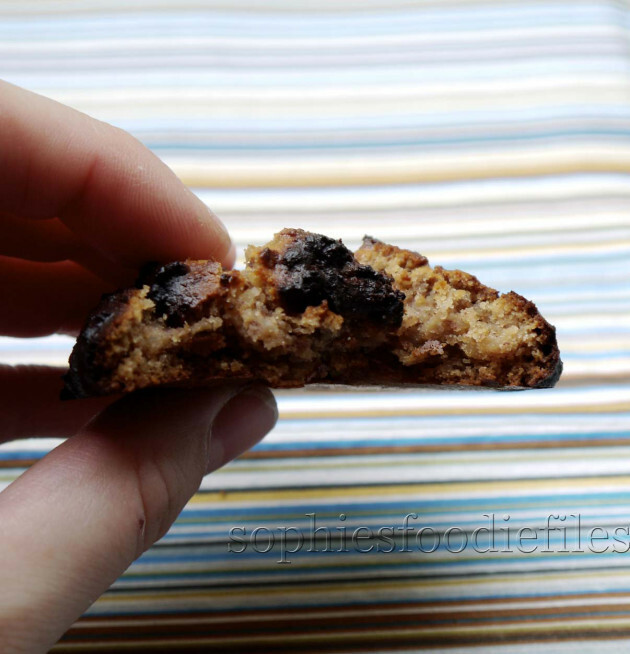 Your dough is well moist, sticky and dark brown in colour because of the almond butter. 4. Take a baking tray & lay a silpat on the tray. With the help of 2 tablespoons spoon the mixture onto the silpat. Make them not too big & heap them up a bit. Leave a bit of space between each cookie. The dough will stick. I had about 11 cookies on 1 sheet and 10 cookies on the other, a bit spaced apart. 5. Bake in the lower end of the oven for about 15 to 20 minutes depending of your oven. Watch your cookies & lower the heat, if you need to, to prevent burning! 6. When they are golden and ready, take trays out of the oven with oven gloves & let them sit on the silpat for about 10 minutes before removing them on wire racks to cool down. This will give them a lovely shine on the bottom of the cookies and also they won’t fall apart so easily! Let them cool down completely. These are made in a few minutes in your food processor, then padded down with your hands or a hand spatula. 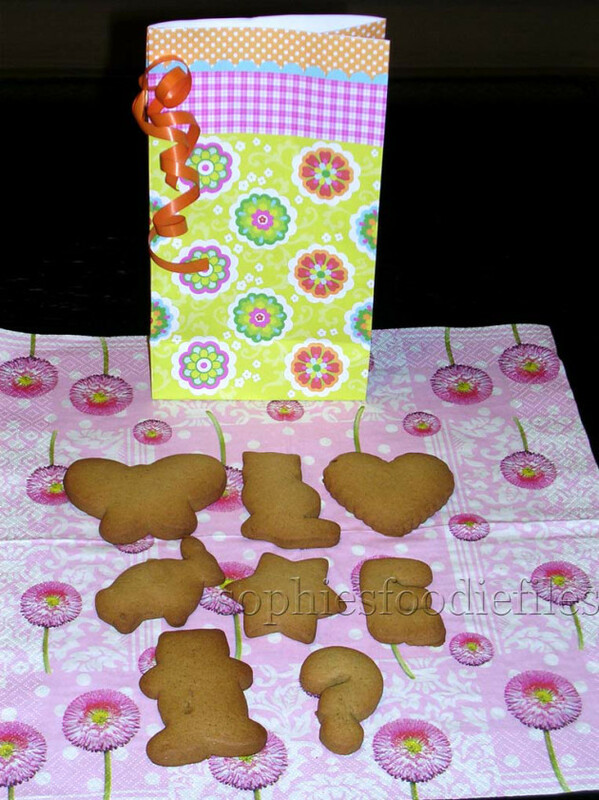 I used my cookie cutters to create cute cookies! I placed them into the fridge to stiff up for at least 1 hour. Because there is coconut oil in them, just take them 5-10 minutes before eating out of the fridge otherwise they are way to cold & after 15 minutes or so, your coconut oil will start to melt & you don’t want messy hands! 🙂 They are fudgy too,…That is why, Peter & I both love them. 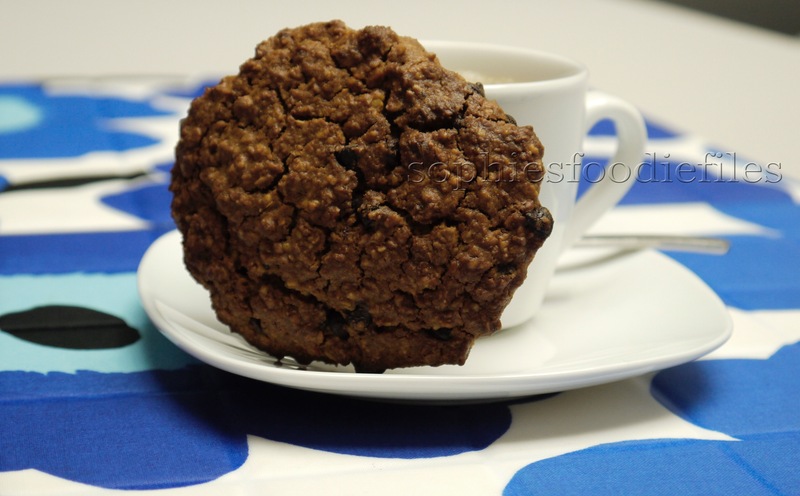 We eat them as a nice quick healthy snack with our afternoon tea of café latte. You see? 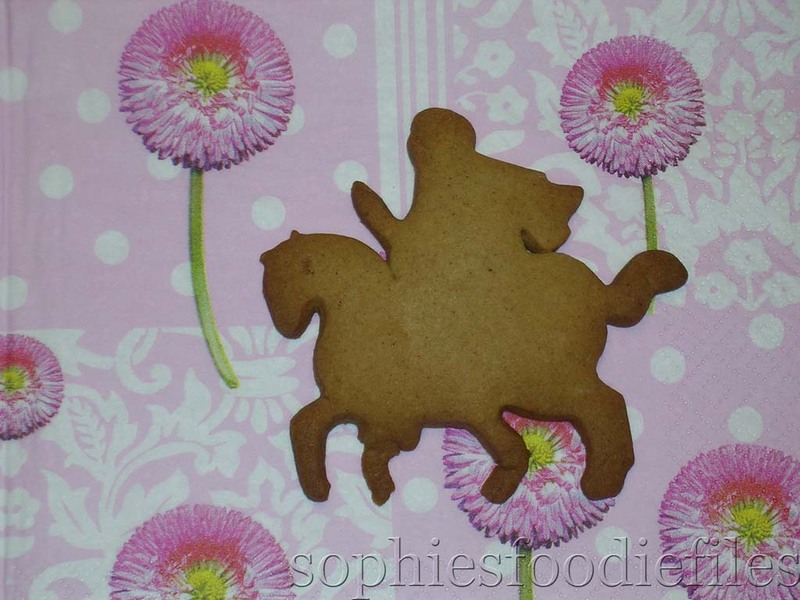 Here is one of many favourite cookie cutters: a knight on his horse! A knight on his horse! Do you know this famous Belgian man? Yes, It’s Manneken Pis! Click on the link to find out who he is!! Speculaas (Dutch pronunciation: [spekyˈlaːs], Flemish speculoos, French spéculoos) is a type of short crustbiscuit (cookie), traditionally baked for consumption on St Nicholas’ Eve in the Netherlands (December 5) and Belgium (December 6). In recent years it has become available all year round. Speculaas are thin, very crunchy, slightly browned and, most definitely, have some image or figure (often from the traditional stories about St. Nicholas) stamped on the front side before baking, the back is flat. Speculaas dough does not rise much. Normally, Sinterklaas comes in Belgium, in the night of 5th december to 6th december. On the evening of the 5th of December, the children put their shoes next to the chimney. They lay sugar beets or carrots for the Saints horse. They also present food or drinks for Sinterklaas near the chimney because he must have been hungry during the night because he works a lot & he rides his horse & goes along with the dark men on the top of the roofs on everybody’s houses. He gives mandarins, sweets & speculoos. Normally, he also gives presents to the children. You can read it in French & in Dutch. Most Speculaas versions are made from white flour, brown sugar, butter and spices. Some varieties use some almond flour and have slivered almonds embedded in the bottom. Spices used in speculaas spices are cinnamon, nutmeg, cloves, piment, ginger, cardamom, mace & coriander. We buy them in 20 gr sachets, ready to use. Mix all the spices well together & place in a fitting bowl & screw the lid well on. Shake well until all joined. Use 2 teaspoons. There are several interpretations for the origins of the name Speculaas. It may derive from Latinspeculum, which means mirror, and refer to the images are cut as a mirrored bas-relief into a wooden stamp which is then used to decorate the Speculaas. Another explanation of the name refers to the Latin word speculator which, among other meanings, could also refer to a bishop or St Nicholas’ epithet “he who sees everything”. Specerij the Dutch word for spice is another possible origin. 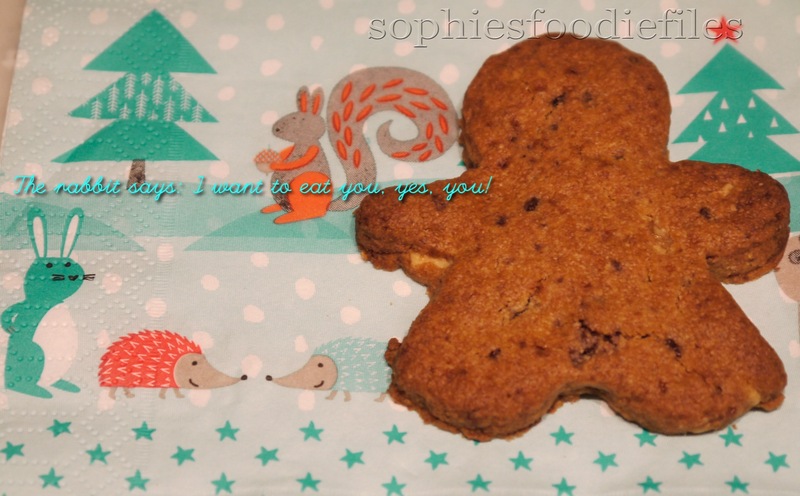 I love this yummy recipe for home-made speculaas. 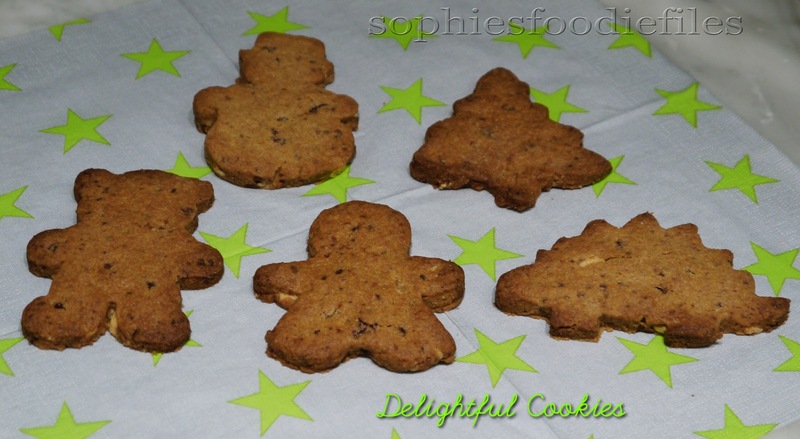 These are crunchy speculaas & a bit soft in the middle. 1. Take your Kenwood or Kitchen aide & put the K-paddle in. 2. In a large bowl, sieve the flour & sieve the baking powder. Set aside. 3. Put the softened butter in the fitting bowl together with the sugar. Mix it until it all is well combined. 4. Add the beaten eggs & mix well. 5. Add the speculaas spices & the sifted flour and baking powder. Mix until it all is well combined. It is now brown in colour. Place the mix onto a floured silpat with floured hands & mix well until you have a thick dough, for about 1 to 2 minutes. The dough will be very sticky. Place cling film all over & place into the fridge, on a plate, for at least 1 to 2 hours to stiffen up. You can also leave it overnight in the fridge. I never do. I can’t wait that long! 6. Preheat your oven to 175°C, ( 347 F ) if you are using a normal oven. 150°C ( 302 F ) fan oven, for 15 minutes. Take 2 oven racks out of the oven & lay silpats on them. I use a fan oven. 7. Take your dough out of the fridge, open the cling film & slice 1 big piece, 1/3 th of the dough. Place the other dough back into the cling film & place into the fridge until you want another piece to work with. So, that the dough will stay firm. Now, lay your silpat in front of you on the table. Flour well. Flour the rolling-pin & roll the dough out to 0,5 cm thick. 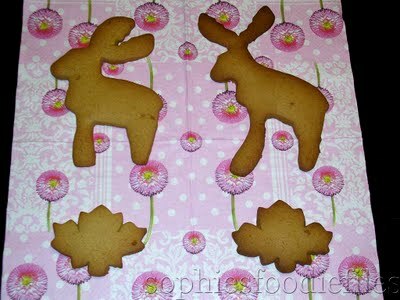 With your favourite cookie cutters, cut out cookies & reuse the dough again & again until it is all used up. Do flour your Silpat from time to time, because you don’t want the dough to stick. Place onto a silpat on an oven rack, well spaced apart, about 1 inch ( 2,5 cm ) apart & bake for about 13 to 15 minutes until browned & cooked through. In my case, it took every time 15 minutes. Take out of the oven & place onto wiring racks to cool down completely. Do the same to the rest of the dough. 8. 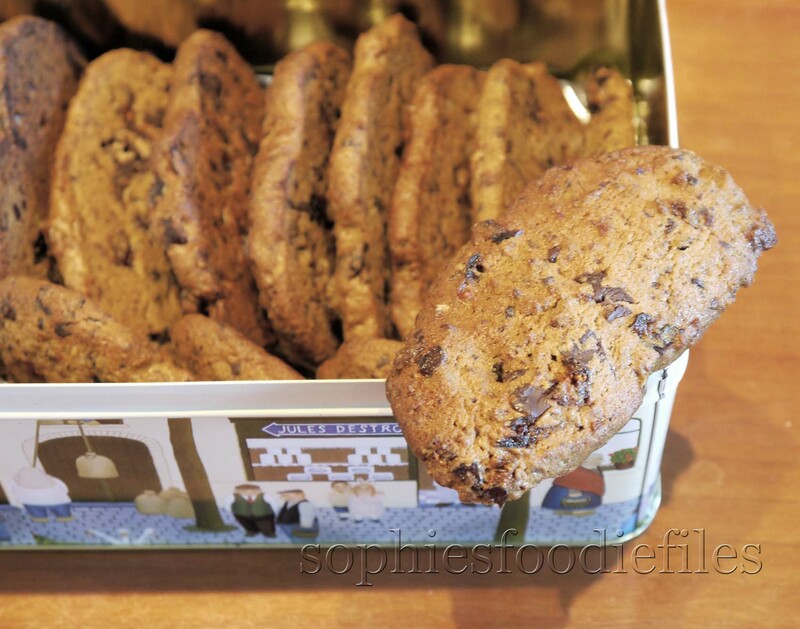 When the cookies are completely cold, place into cookie boxes to store or give them as presents. These are crunchy cookies & a bit soft in the middle. Enjoy with a good cup of coffee or an excellent cup of tea! These treats make excellent food gifts! 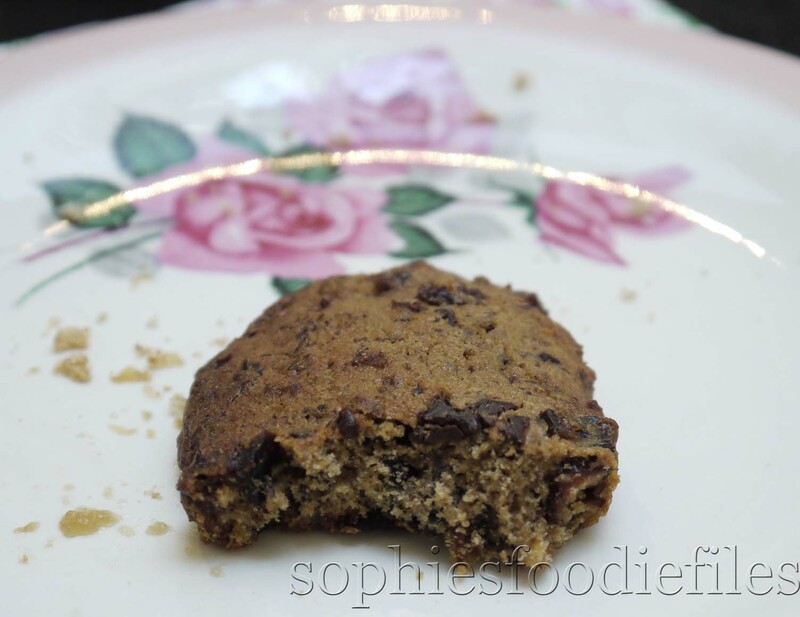 Vegan spelt crunchy double chocolate cookies! Yesterday, I made these divine wonderful cut-out cookies! They are very simple to make! They are crunchy cookies & I added chopped vegan white chocolate & chopped vegan milk chocolate to it all! So they are like Heaven! Don’t you want a few of them with your coffee? 1. Take your Kenwood & place your bowl & K-paddle in. Add softened butter & coconut sugar. Cream until fully mixed & creamy on medium-speed. Check often! It will be beige-brown in color. Add spelt flour. Mix until fully mixed in. Sometimes, stop the machine & scrape the sides & mix again & again. Add almond milk & mix in. 2. I took my food processor & added the vegan white chocolate pieces & the vegan milk chocolate pieces & pulsed until they were to my liking. I ended up with smaller bits of chocolate & a bit of chocolate powder. This is what I wanted! Add this chocolate mix to your dough. Mix on medium to high-speed until joined. 4. Preheat your oven to 180° C ( 350 F ) for 10 minutes. Take your dough out of the fridge & out of the cling film & cut your dough into 2 equal sides. One, you are going to work with & the other, place it back into the fridge, in the cling film, for later on. Flour your kitchen counter with some of the whole-wheat spelt flour. Flour a rolling-pin too, to prevent sticking to the dough! Place this dough on your kitchen counter & flatten it out with your hand palms & with your rolling-pin! Roll the dough into 4 directions until you end up with a dough, equal in thickness, about 0.5 cm thick. You can make the cookies thicker, if you like, but I like mine this way! 🙂 When you have the right thickness, place your cookie cutters into the dough & push them really into it. 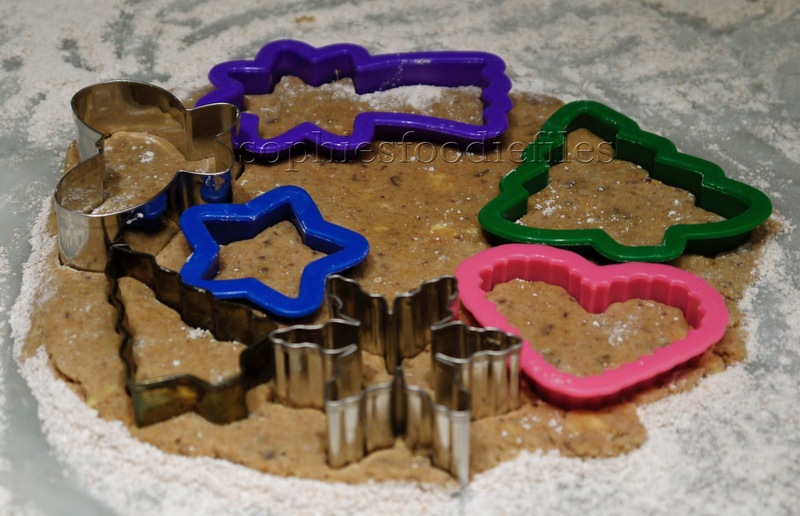 With help of your hands, push the dough, right into the sides & all over the base of your cookie cutter. ♥ Stay Tuned & subscribe by email! Join 1,800 email subscribers now!!! It is free!!!! Click the link here below to subscribe!!! Get my free E-book: Healthy Vegan christmas too! 1. Lovely lemon shortbread cut-out cookies! 2. Vegan chocolate chip cream cheese cut-out cookies! 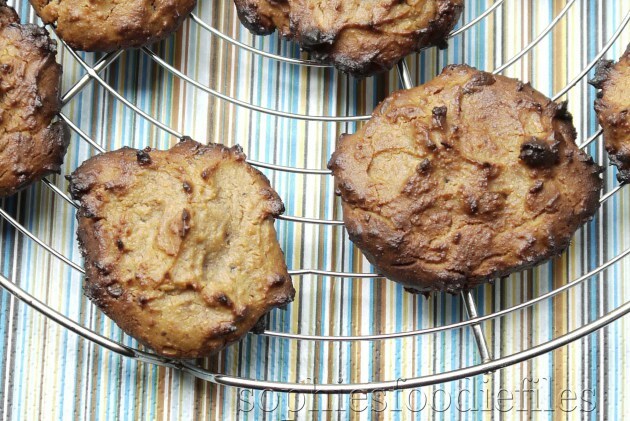 Vegan coconut chocolate chip oat cookies! 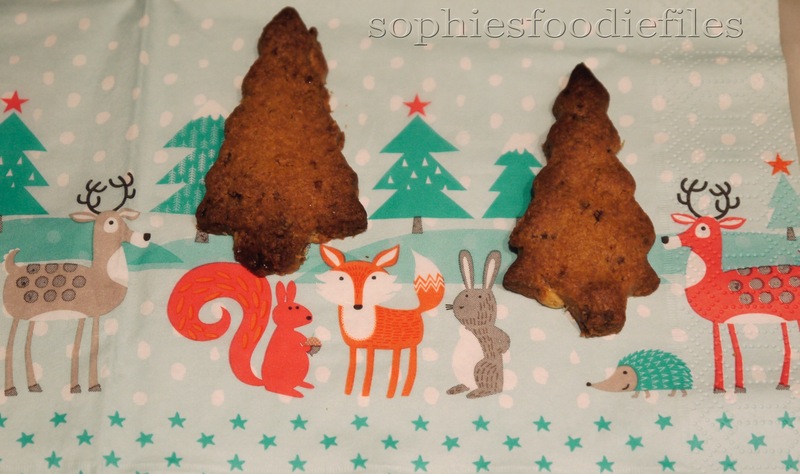 Sean & Linda said: ” We made your tasty cookies yesterday evening & we both love them so much, sweet Sophie! You want a big bite, don’t you? 1. Place your solid coconut oil in a fitted cooking pot & let it completely melt on lower heat. Stir often. Turn heat off & set aside. In a medium bowl, pour coconut oil & add coconut sugar. Mix well with a spoon. Now, add oats, oat flour, pinch of sea salt & baking soda. Mix well through. Now, add coconut-rice milk, chocolate chips & coconut flakes. Mix well. Taste! You must taste the coconut & chocolate chips. The dough tastes a bit sweet but not too sweet either, just right! 😉 Place cling film over the top & place to rest in the fridge for 30 minutes. This way, the dough will stiff up in the fridge. Stay tuned, Subscribe through the photo link below to get my new cool newsletters aka posts! Join 1,800 email Subscribers! It is free! Click onto this link below! A wholesome food gift! 🙂 Tasty, tasty, tasty too! Recipe: For about 20 larger cookies! a bit of lukewarm water to dissolve your yeast in, not too much! 1. Take your food processor & add S-blade. Add cranberries & chocolate. Pulse until they form smaller pieces, or pulse them just to the size that you want them to be. You also can do this by hand, cutting with a knife,…it is up to you! 2. Take a larger bowl & add butter, sugar & salt. Cream it all together. Mix the eggs through it. Add flour, dissolved yeast, baking soda & chocolate pieces & mix for about 2 minutes, until fully incorporated. With the help of a spoon, stir the cranberry pieces & flax seeds through the dough. You can also do this in your Kenwood bowl with your kitchen robot! It makes my life easy! Roll this dough out into a larger sausage shape with a thickness of about 4 cm. Place cling film over it & place in the fridge, to stiff up a bit, for at least 2 hours! 3. 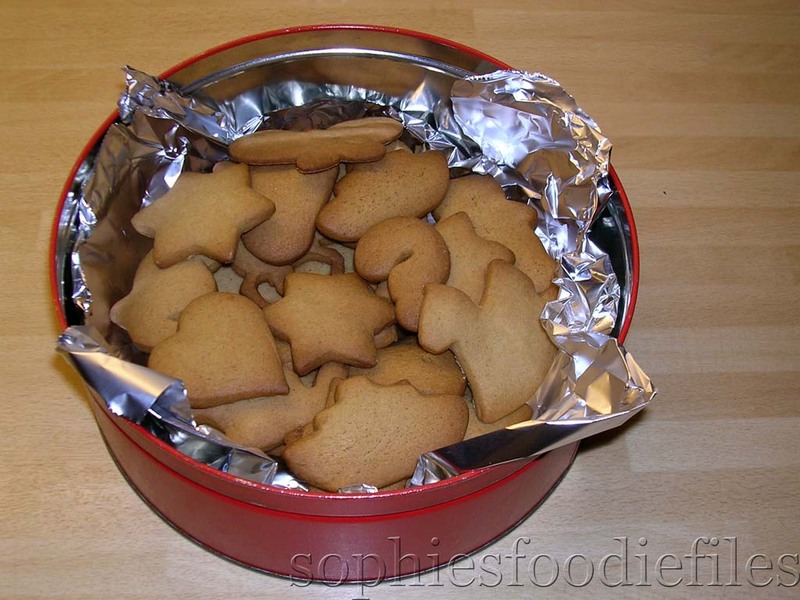 Take 2 baking trays out of your oven & place a Silpat over it. Preheat your oven to 180°C ( 350 F ) for 10 minutes. I always use a fan oven. Adjust your oven to the right temperature! Place the baking trays with the Silpats on it , close to you. Take your stiffened up dough out of the fridge & remove the cling film. On a lightly floured kitchen counter, with the same spelt flour, of course, cut up the dough into larger or smaller cookie shapes, just the way you like them. My mom made them larger, see picture above. She flattened them a bit & placed them well spaced apart on the Silpat. Do the same with the remaining dough. Bake them for about 12 minutes & let them on the Silpat for about 10 minutes. This will give a lovely shine on the bottom of your cookies. After that, transfer them to a wire rack to cool down completely! If you have leftovers, place them in a lined cookie box! 🙂 They are excellent with fresh cup of coffee! You don’t taste the yeast at all! 😉 Stay tuned, Subscribe by email through the link below to get my new cool newsletters aka posts! Join 1,800 email Subscribers! It is free!